I can hardly believe I have yet to blog about this, one of my all-time favourite plants. 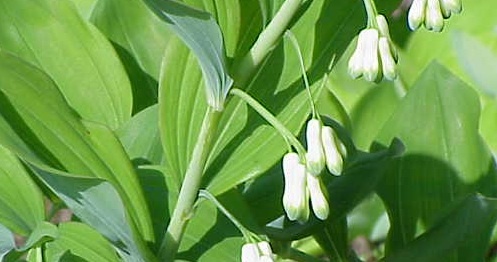 Polygonatum x hybridum is Solomon’s seal, an ideal plant for a dank, shady spot. Mine is thriving near a north-facing wall and growing in what appears to be solid clay. It’s a quiet plant with arching stems and striated green leaves – the principal attraction really, as the white bell-like flowers, lightly tinged green, hang down from the undersides and are all but hidden. You have to turn the stem upwards to see them. It’s related to lily-of-the-valley (Convallaria majalis) – and like that plant, it can prove difficult to establish. Rather than buying one from a garden centre, it’s better to beg a piece from a friend, making sure that the transplant has a good clod of its home earth clinging to the roots. I have regularly dug up bits of mine, but think I shall leave it for a year or two and see how far it will spread. I understand there are variegated forms – but the ordinary one is good enough for me.